Hey everyone! All hope for this blog is not lost yet. I'm still here... just slow at updating and still trying to get back into doing more than one nail art per week. I'm not a fan of pineapples unless they're in pizza and even then I don't like too many pineapple chunks. However, I've always been fascinated by the fruit. It just looks freaking cool and smells amazing. You can't deny the uniqueness of the pineapple. Come to think of it, tropical fruits are all super cool. As you can see, I started off with V-shaped designs which are easy to achieve with tape. Just make sure you 'dab' the tape a few times so that it's less sticky. 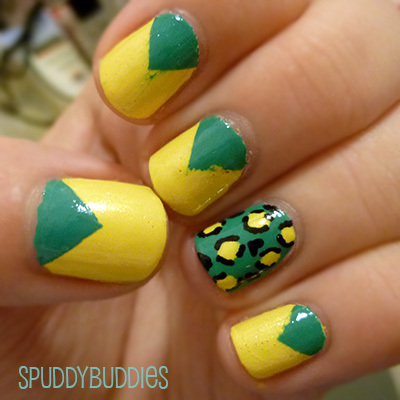 I painted the green V tips OVER the yellow as opposed to painting the yellow over the green. 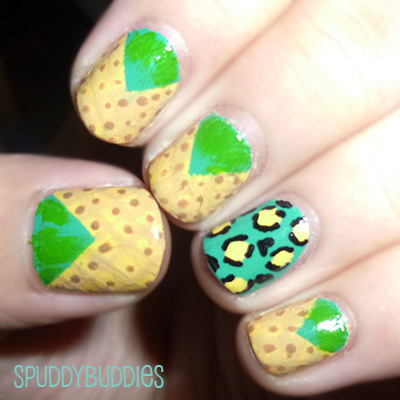 I honestly did not intend to do a pineapple design and I wore my nails like this for a day or two. And then I got bored and wanted to remove this design... but then I had a brilliant idea. I'll mess with the design BEFORE I remove it. I already thought the color combo was like a pineapple's so I just went with it. You can't really see the criss-cross pattern in this picture with flash but in the photo below it's more obvious. 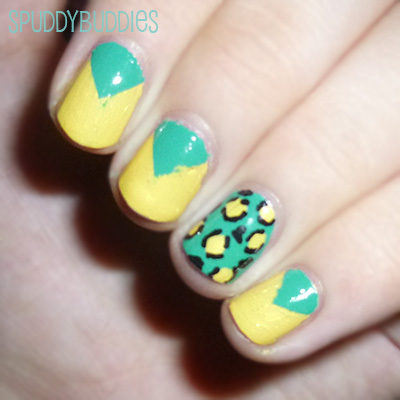 I LOVE that the accent nail was a leopard print because it just looks so cute tied together and the colors are amazing. I don't know what made me brush on green polish onto the V tips but that wasn't very smart. I should have just left it at the V tips. Still, it was NOT obvious at all under normal light and sunlight. The flash is just to give you a clear picture of what I did. I cannot for the lunch in me think remember the exact polishes I used because I did this last year but I do remember using Revlon Top Speed Yellow as the yellow base. I LOVED doing this design. It was very tedious to do mix the polishes to get the exact shade of browns that I wanted and to draw the criss-cross 'boxes' (my fruit vocab rocks) but it was worth it. I wore this design for a couple more days and was sad to remove it at the end of the week. Definitely would do this again. I just don't think I brought that blue-green polish with me. Blegh. 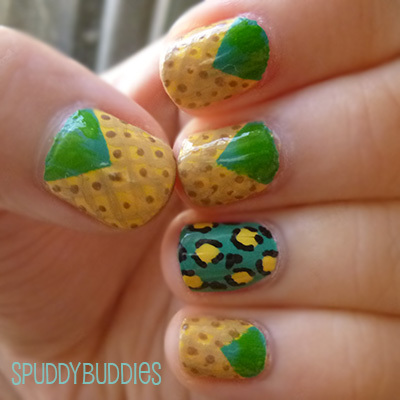 OH, an idea: what about a Valentine's Day themed tropical fruit nail art?! 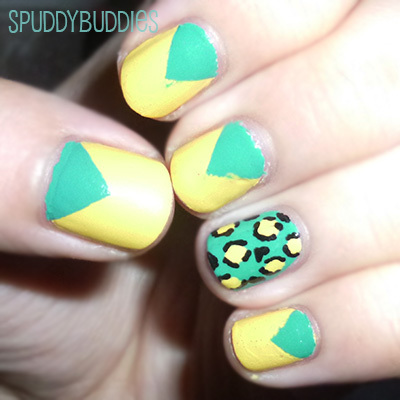 A pink pineapple and red leopard print accent nail? How cool would that be?!! Thanks for reading and being patient with me!